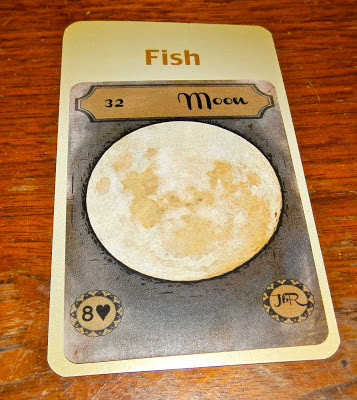 Today's Draw: Moon in the House of Fish from the Vintage Lenormand by Jera Babylon Rootweaver and the Deck of Lenormand Houses by Me. So what else might be keeping you from making that change you're considering? Are you waiting for the money to make the change? Or is it possible that, if the change came first, the money would follow? Today's draw predicts that fame brings money. But because my Deck of 1000 Spreads is all over the bestseller list for the fortunetelling category, it's clear that reading is for me and not for you. Actually, what really happened with today's draw is that there is a tarot card called The Moon. It means confusion and sort of cloudy thoughts. Things aren't clear. So when I first saw today's draw and started thinking of it in the context of this week's theme of making changes, I was thinking we'd talk about how many changes are stalled because of the money factor...because of a lack of clear sight of where the money is going to come from for our changes. There are a lot of dreams and changes that don't require money to make it happen. But that's the #1 thing I hear people say they're waiting on. It's certainly the #1 thing I worry about when I think about leaving it all behind me, moving to Maine, living full-time as an author and traveling the country in an RV full of dogs to greet my adoring fans. The good thing is that I have some perspective on this, because 15 years ago I walked away from my job to become a freelancer and never had to worry about money in making that change. Now, I did have some savings as a backup. But from the first month as a freelancer, I was making more money than I did when I was employed. The money was irrelevant. The money followed closely behind my pursuit of my dream. The thing about waiting for the money is that it's just an excuse. Because it's a problem that rarely ever gets solved sufficiently enough to make us overcome our fears. So we stay in loveless marriages, remain in thankless jobs and continue with careers and lives that were someone else's dreams for us, rather than our own. One of the many pics I took of my bestseller rankings yesterday. It's not about the money. It seems like it is, but that's just what we tell ourselves to remain trapped by our fears. I know the economy is bad and not mending fast enough. But, bolstered by the positive energy of chasing a dream, we always find a way. You know if you want it enough, you will find a way. It may mean your lifestyle is not as cushy as the one you have now for a while. But you KNOW you will find a way. My personal belief is that change happens when the fear of keeping things the way they are becomes greater than the fear of changing. Maybe I'm fooling myself, but part of my issue is that I still find my day job compelling. Even after 25 years. When I leave, I'll be leaving something I love. So it would seem like my plan of attack has been to have feet in both worlds (like we talked about yesterday) and build up enough momentum to knock me entirely into the other world...haha. I think that, if we're using money as an excuse, we might do ourselves a favor by being honest. "I'm staying with him because I'm afraid I can't make it on my own." "I'm putting up with this job because I'm afraid I'm not competitive enough for the marketplace." "I'm living someone else's dream because I'm afraid I'm not worthy of my dream." Or "I'm inching toward my dreams because I'm afraid (and too lazy) to go balls to the wall and risk utter ruin." If we started using REAL excuses, I think we'd hate admitting it so much that we'd shame ourselves into changing...haha. Or something like that. But I do think we need to be honest. At least with ourselves. Because then we could put the energy we waste on wondering about money toward dissecting our real fears and seeing that they're not good enough to keep us from reaching for life's brass ring.